10 Days of Continuous Prayer Praying for Durbanville and Beyond. 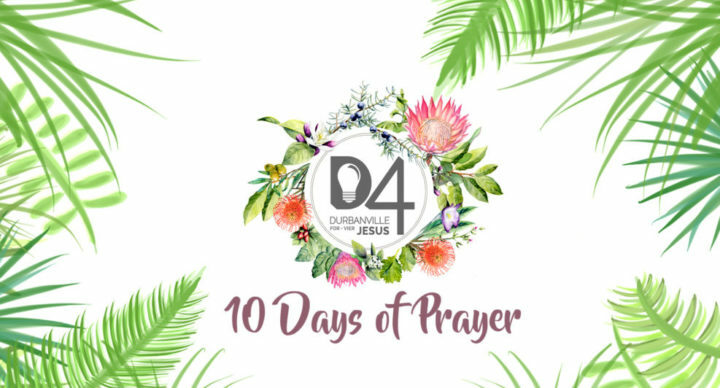 ESCC will be hosting the D4 prayer room, open to all churches in our community for 10 days of continuous prayer. 16 local churches will be participating this year. You, your family including your children and teens, friends, your cell group, your neighbours …. EVERYONE! Each church taking part will get 24 hours to fill, in one-hour slots. ESCC will be on Thursday, 10th May from 00:00am through to 23:59pm. Contact your church to find out what day they are hosting. Claim your hour and sign up. OR – come on any day or at any time that you want. Everyone is welcome at any time. Entrance through Streams during working hours. Follow the arrows after working hours …. ESCC members: We host the room on Thursday 10th May. Other churches: contact your church to find out what day you are hosting. Or – come any day you want to – everyone welcome at all times!